What causes Coronary Heart Disease (CHD)? The prevailing hypothesis right now is that CHD is caused by high levels of LDL over many years, although, as will be discussed later, other biological factors can either enhance the damage LDL causes or protect against excess LDL. As I described earlier, LDL is a lipid droplet surrounded by a structural protein. The lipid droplet mainly carries cholesterol in the form of esters, and there are about 1500 cholesteryl ester molecules per LDL particle. The most agreed upon mechanism how an increased blood LDL concentration causes coronary arteries to become blocked is that LDL invades the area under the the endothelial cell lining of the arteries (See following figure). This area, called the subendothelial space, becomes infiltrated with LDL particles and cells (monocytes/macrophages) that are charged with keeping the subendothelial space clean. In most of us, for much of the first 30-40 years of life, HDL particles return excess cholesterol to the liver for disposal and the plaque remains small and benign. 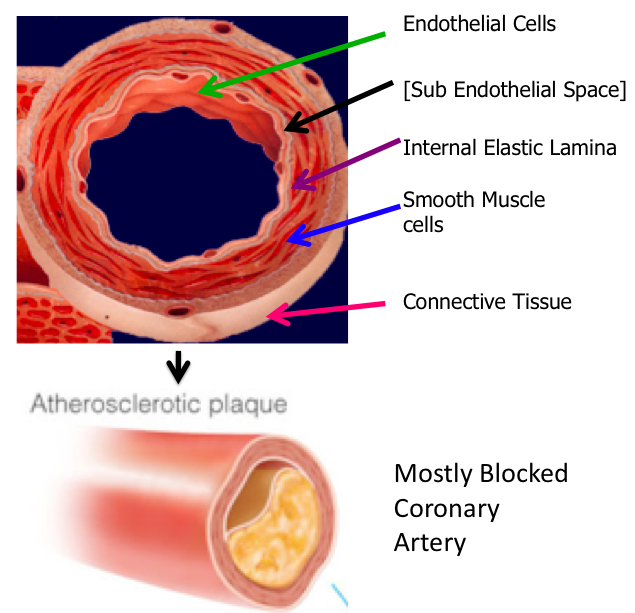 But over decades, after the blood LDL cholesterol starts to increase, the process of cleaning out the subendothelial space can be overwhelmed, and cholesterol, debris, foam cells (engorged macrophages), and other constituents can accumulate in the artery wall and partially block the lumen (opening) of the artery. A heart attack occurs when the artery is totally occluded. This occurs most often when a plaque from another region ruptures and travels to the site of the partial blockage and causes a total or near total blockage. When blood cannot flow to certain areas of the heart, heart muscle cells in that region do not get enough oxygen and die. This basic mechanism is extremely complex and involves many different cell types and a multitude of proteins and signaling molecules. The precise steps have still not been worked out and active research is still being conducted by many different laboratories. The experimental evidence that LDL causes CHD was developed over a 50 – 60 year period after the discovery of the lipoprotein families and the development of methods used to isolate lipoproteins and study them and their metabolism. Brown and Goldstein’s work with patients with familial hypercholesterolemia, some of whom died of heart attacks as early as six years old, showed that defects in the LDL receptor of cells were responsible for the very high build up of LDL in blood in most cases of patients with obviously some kind of hyperlipidemia. What about the rest of us – those without a genetic hyperlipidemia? As also discussed earlier, the LDL receptor number or activity decreases with age. When combined with an atherogenic diet or with some other risk factor, the likelihood of developing CHD increases as we become older. What to do about cholesterol and increased CHD in the rest of us was answered with a scientific discovery made by Akira Endo in Japan. Dr. Endo worked for Sankyo Chemicals and he was interested in finding an inhibitor of cholesterol synthesis in fungi, just as penicillin was discovered and isolated from the fungus, Penicillium notatum. After testing many different preparations from different fungi, Dr. Endo finally isolated a compound from Penicillium citrinum that could inhibit the enzyme HMG CoA reductase, an enzyme in the cholesterol synthesis pathway. After determining the structure of the compound, it was called mevastatin (also called compactin) due to its similarity to mevalonate, an intermediate in the pathway. Sankyo Chemical Company enticed Merck and Company in the US to become interested in mevastatin. Using data and insights into mevastatin from Sankyo, scientists at Merck isolated, from a different fungus, a very similar compound that was a slightly more powerful inhibitor of cholesterol synthesis than mevastatin. This compound was call lovastatin, and it was approved by the Food and Drug Administration in 1987 and became the first prescription statin drug, known as Mevacor. What Dr. Endo had discovered in the fungus was an active ingredient (mevastatin or compactin) that was capable of binding to and stopping the enzyme, HMG-CoA reductase, one of the early enzymes in the complicated pathway of cholesterol synthesis. The following figure gives clues to how mevastatin works. 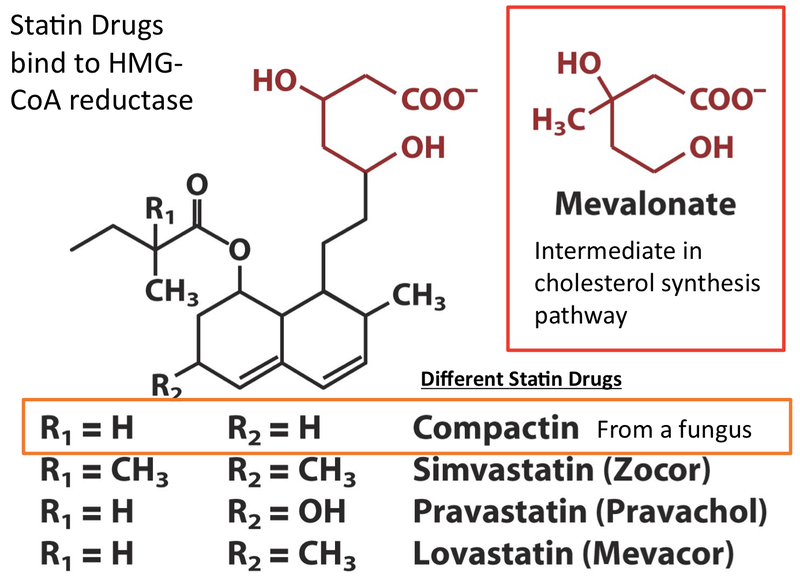 Mevastatin was extracted from the fungus and a portion of the molecule remarkably resembles the configuration of mevalonate, the intermediate in the cholesterol synthesis pathway. When mevastatin enters a cell, it binds to the enzyme that normally produces mevalonate from hydroxy methyl glutaryl Coenyme A. This prevents mevalonate from being formed in the reaction from the natural substrate. As you might expect, the tighter an inhibitor like mevastatin can bind to the enzyme, the more effective the inhibitor will be. When studies noted that mevastatin could decrease LDL in the blood of humans, many pharmaceutical companied developed research programs to find compounds that were similar to mevastatin but more powerful than mevastatin. Therefore, as shown in the following figure, pharmaceutical companies developed a series of compounds that were very similar to mevastatin, but bound tighter to the HMG CoA reductase enzyme targeted in the pathway. Thus, once the original chemical was isolated from the fungus, pharmaceutical company chemists worked to alter the structure slightly in order to improve the drug. This explains the rapid development of more potent statin drugs over the twenty year period after mevastatin was discovered in Dr. Endo’s fungal preparation. Several companies were indeed very successful and now this class of pharmaceuticals, known as statins, is one of the most prescribed drugs in the entire world. But how do Statins Lower Blood LDL? 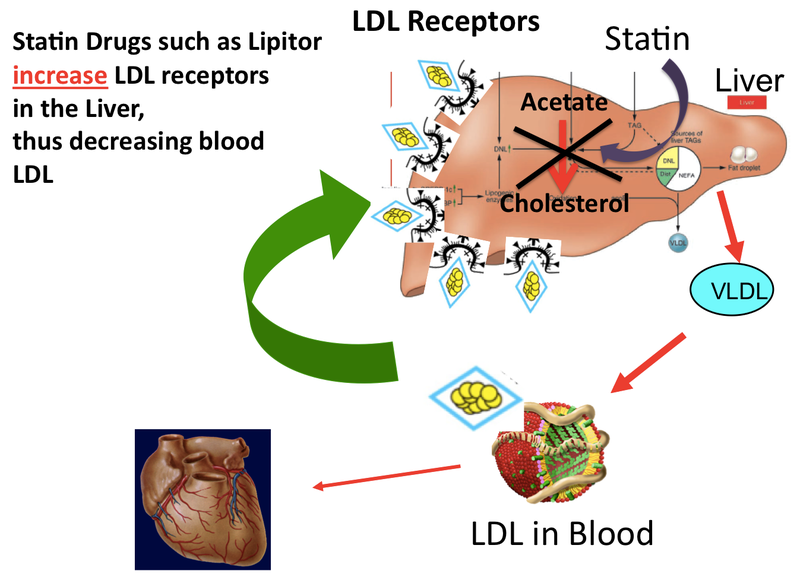 The mechanism how statin drugs lower LDL cholesterol, and thus total cholesterol in blood, is an interesting one. Although HMG CoAreductase is present in almost all cells, it is the enzyme in liver cells that is especially important for the regulation of blood LDL concentrations. As demonstrated in the following figure, after the statin binds to HMG-CoA reductase in liver cells, it inhibits the synthesis of cholesterol (Large cross bars in liver) in liver. Lower cholesterol levels in liver cells (Shown as a whole liver in the figure) are sensed and the cells increase the synthesis of LDL receptors, which go to the cell membrane. The increased number of LDL receptors take up more LDL from blood so that the liver cells can have enough cholesterol for their membranes and other pathways. What have the Clinical Trials Told Us about Statins? In 2010, a meta analysis of 21 trials involving statins vs placebo (129,526 individuals; median follow-up 4.8 years) and 5 additional studies that tested an aggressive statin dose versus a lower statin dose indicated that statins caused an all-cause mortality decrease of 10% per 1.0 mmol/L drop in LDL concentration (RR 0·90, 95% CI 0.87–0.93; p<0.0001). This decrease in mortality was largely due to decreases in coronary heart disease (RR 0·80, 99% CI 0.74–0.87; p<0.0001). Therefore, for every lowering of 1 mmol/L (39 mg /dl) of LDL cholesterol, a 10% reduction in CHD is expected. The large number of subjects put to rest the questions of whether statins increased deaths due to cancer or other non-vascular causes. The answer was that they did not. Statins are fairly safe drugs, although side effects such as muscle pain are certainly a possibility. Efficacy and safety of more intensive lowering of LDL cholesterol: a meta-analysis of data from 170,000 participants in 26 randomised trials. Cholesterol Treatment Trialists’ (CTT) Collaboration. Lancet 2010; 376: 1670–81. Why do some people not show increased blood cholesterol with an atherogenic diet or with increasing age? The observation that some people are refractory to cholesterol has now been explained by the discovery of PCSK9, a protein that is involved in diverting LDL receptors for degradation inside cells (especially liver cells). When PCSK9 is mutated, individuals have more LDL receptors on their membranes. Approximately 1/30 persons have one allele coding for a mutation in the PCSK9 protein such that blood LDL cholesterol concentrations are decreased by about 15% and CHD is lowered about 45% in these people. In populations that have both PCSK9 alleles mutated, and thus have much higher LDL receptors on their cell membranes, LDL cholesterol was decreased by 40% and these lucky individuals presented with a 90% decrease in CHD. The presiding thoughts are that lifelong loss of PCSK9 protein leads to low blood LDL over a lifetime, very strong protection against LDL directed plaque development, and thus much lower rates of CHD. A small percentage of individuals have higher PCSK9 activity, and thus, they have higher LDL cholesterol levels and increased risk for CHD. The PCSK9 story illustrates that the basic mechanism for removing LDL from the blood using the LDL receptor, as detailed by Goldstein and Brown, was correct, but that genetic diversity led to more complicated regulation than originally observed. The PCSK9 story also reinforces the role of LDL cholesterol levels in the basic etiology of CHD. Many studies by investigators all over the world have given support to Ancel Keys’ original observation – that blood cholesterol, especially very high blood cholesterol concentrations, are associated with coronary heart disease, and in fact, as shown in later studies, LDL cholesterol was shown to be a direct player in increasing the development of coronary artery plaques. There is certainly evidence that other factors play a role in CHD, such that some people with high LDL do not get disease and some people with low LDL concentrations may develop disease. The differences in biological variability among people, even within fairly well defined and stable populations, are quite wide, such that making precise accurate predictions concerning which individuals will get CHD are difficult.